Set on the west side of the Wye just above the valley floor, Llowes church and the village that surrounds it occupy a spur between the main valley and a dingle formed by a small tributary that runs off the lower slopes of The Begwms to the north-west. Below the churchyard the stream loops around and takes a north-easterly route to the Wye providing a low promontory on which the church was established. The village has grown up on both banks of the stream and is now expanding up the hill behind the church. Hay-on-Wye lies about 4km off to the east on the opposite bank of the river, while Glasbury and another bridging point is 3km to the south-west. This brief report examines Llowes’ emergence and development up to 1750. For the more recent history of the settlement, it will be necessary to look at other sources of information and particularly at the origins and nature of the buildings within it. The accompanying map is offered as an indicative guide to the historic settlement. The continuous line defining the historic core offers a visual interpretation of the area within which the settlement developed, based on our interpretation of the evidence currently to hand. It is not an immutable boundary line, and may need to be modified as new discoveries are made. The map does not show those areas or buildings that are statutorily designated, nor does it pick out those sites or features that are specifically mentioned in the text. Reproduced by permission of Ordnance Survey® on behalf of HMSO. © Crown copyright and database right 2009. All rights reserved. St Meilig is said to have come from Clydeside in c.AD 650 and he or his successors are believed to have established a clas community at Llowes. Whilst the church is fficially dedicated to St Meilig, the name of the settlement reflects an obscure holy man St Llywes (Lyuhes) who was supposedly already established here when he was joined by Meilig. This in turn appears to be linked to old Welsh loches/llochwes meaning ‘ a refuge or place of safety’. It is mentioned both in the Liber Landavensis and by Geraldus Cambrensis. The former has it as podum liuhess in eluail with a date broadly in the second quarter of the 12th century, and Geraldus referred to it as Locheis. In the papal taxation of 1291 it was named as both Lewas and Lockwas. There is a reference, unsubstantiated, to the fact that an anchorite named Wechelen had a hermitage here in the 12th century (4347). The nature of the subsequent development of the settlement can only be guessed at. In a survey of 1816, it consisted of a church, public house, mill and nine dwellings. 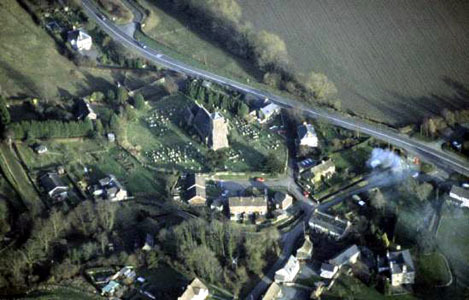 Unlike some settlements there is no suggestive patterning, and the only archaeological work in the village – a watching brief in 2000 – failed to identify any medieval or later traces of activity next to Mill Cottages. No traces of the early medieval 'clas' community have been recognised. It can be no more than supposition, albeit a reasonable one, that it lay on the spot now occupied by the church. The nave and chancel of St Meilig's church (16039) were rebuilt between 1853 and 1855, but the west tower is medieval, its later stage added in the Perpendicular style. In addition to the cross (see below), there is an early 13th-century font within the church, but little else of any great interest. The church also houses a remarkable, 11th century decorated cross-slab with a large cross in high relief (399; SAM Rd100). It was moved from the churchyard into the church in 1956, but a local tradition reported in the church is that it was originally set on Bryn-y-rhydd Common, the higher ground to the south-west of the village, at a place called Croesfeilig and was moved to the churchyard at some unknown date. The churchyard (16206) is raised high above the general ground level on its south-east side, but elsewhere its elevation is much less pronounced. Notwithstanding this, it has a strong curvilinear appearance and the linear alignments on its north side hint at modifications to what is essentially an early-medieval design. The Old Vicarage (16073; Grade II listing) incorporates a late medieval, cruck-framed hall house, perhaps of 16th-century date if not earlier. The much altered Radnor Arms Inn (36594; Grade II listing) was said to have a 15th- or 16th-century main range by Cadw, but the Royal Commission claim a 17th-century date for it. Llowes Mill (23005), abandoned in the 1920s, is undated. Llowes Court (25863) is also 16th-century, but at a distance of 300m it falls outside the settlement. A former orchard above Mill Cottages (OS plot 1082) contains what appear to be terraces and platforms (16207), probably the sites of earlier medieval dwellings. East of the church and on the opposite side of the main road (OS plot 3675), the scarp above the stream may have been levelled for use (16209); and a rather more distinctive terraced platform (PAR 16208) is visible higher up the hillside where it is crossed by a footpath. A further platform (16210) in Fron Wood is less convincing.